Aluminum Products have a straight-cut aluminum edge with slightly rounded corners, yielding a unparalleled modern and simple appearance. Aluminum Bottom Stacks feature a swirled border that can be added around the image, to create a striking alternative to an aluminum matted print. Please specify overall size and desired image and border dimensions when ordering. When providing artwork or image files, signatures and crucial components of an image or print should be a minimum of 1/4” from the edge to accommodate trimming. 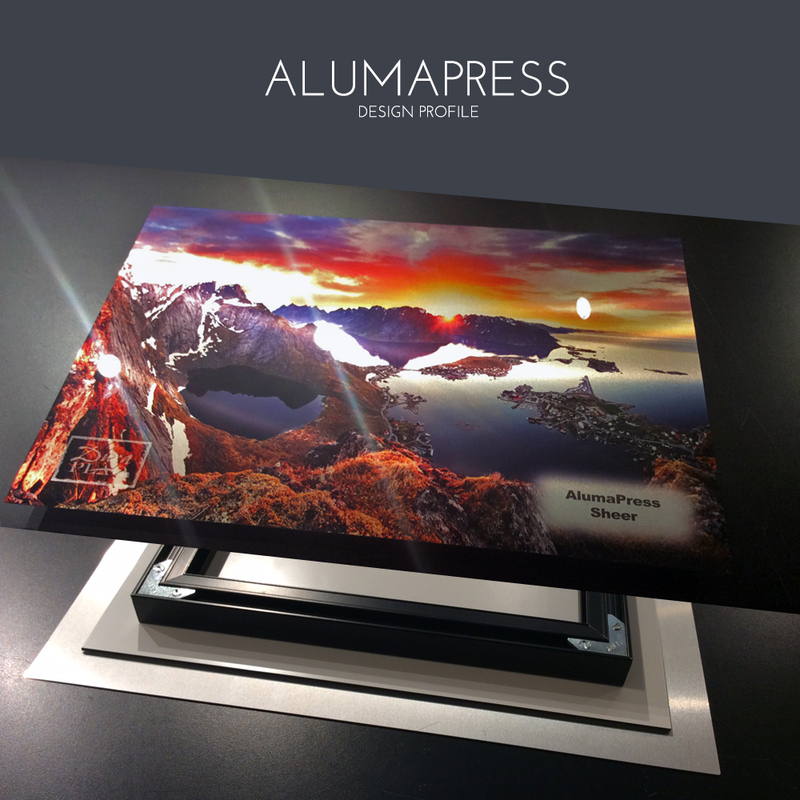 The AlumaPress product features a dye-sublimation ink transfer to white, sheer or matte surface finishes on aluminum. The sheer metal base illustrates a unique a sheer aluminum effect to illuminate the iridescence and allure of metal through the artwork. Comparatively, a white base infused print illustrates a traditional print appearance adding a depth and richness of color. This is a remarkably modern presentation playing up the unique, boldness of metal with a super gloss finish. A protective, acid-free black coating is applied to the back of the infused metal and is completed with a black 1/2” recessed backing with concealed French cleat hanger to give it a floating effect when mounted on the wall. Premium quality, 100% recyclable, infused 3/64” aluminum metal alloy. Protective acid-free backing and French cleat hanger are made of 1/2″ black poly backing with concealed French cleat hanging system. Overall depth of product is approximately 2/3” from front face to wall. This standard product is available in any size up 44” x 96”. AlumaPress products have a super gloss finish similar to the PlexiPlaq product. Please visit the care section for instructions on cleaning and maintenance. Black aluminum boxed frame with a 1” French (metal) cleat hanging system. Each AlumaPress product comes ready to hang, complete with appropriate hanging hardware suitable for traditional wall installations. Custom hanging options, such as standoffs and backing options are available; additional charges may apply. Please visit the care section for hanging instructions on how to hang an AlumaPress. AlumaPress products are not recommended for sizes smaller than 8” x 10” in order to keep the French cleat hanger concealed and recessed. Wire hangers can be added to an AlumaPress, however, DuraPlaq® does not warranty or recommend this hanging method due to instability in hanging. The AlumaPress display has a straight cut aluminum edge with slightly rounded corners. Please note that when providing artwork or image files, signatures and crucial components of an image or print should be a minimum 1/4” from the edge to accommodate manufacturing allowances in the production process. 2) Direct Printing is included in pricing. Mounted Paper Print Pricing is NOT included in product pricing. 3) Specify Sheer or White Aluminum base when ordering the AlumaPress product. 4) AlumaPrint product is direct printed with UV-cured inks to aluminum substrate. 5) AlumaPress products feature a radius/rounded corner. Straight angle corner is available on request. 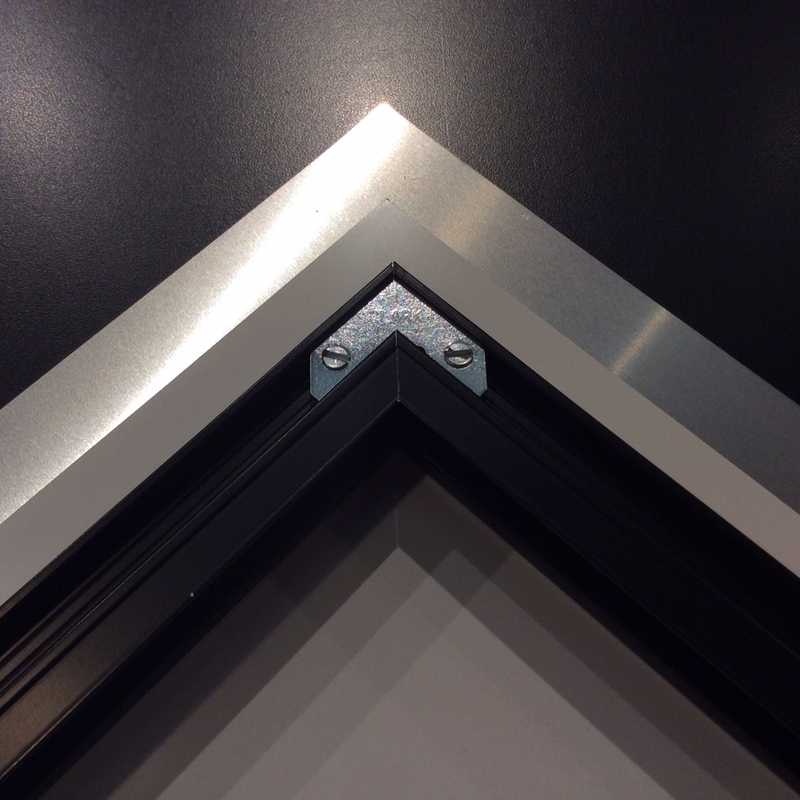 6) Aluminum products feature an aluminum backer supported by an aluminum frame hanging solution with cleat. Complimentary hardware is included in products that feature a hanging solution.